Finally, up and running with my “cookbook”!!! It is overwhelming to know which recipes to share first so, in general, I will be posting what I’m currently cooking or recipes that someone has asked me for recently. 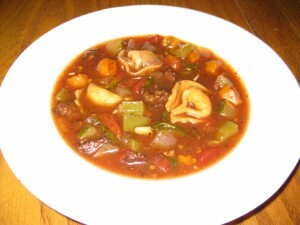 This California Tortellini soup was passed around at work many years ago and is loved by everyone who tries it. Hope you enjoy it too! I know that people like to see pictures and I will be including as many pictures as I can when I get it all figured out. I’m still learning how this all works so if you see dumb mistakes – please bear with me!! And feel free to let me know! Remove casing and brown sausages in a large pot, stirring to crumble the sausage. Remove sausage and reserve 1 tsp. drippings. Saute onion and garlic over medium heat till tender (but not browned). Add ingredients to tomato sauce, add sausage. Simmer over low heat for about 30 minutes. Stir in zucchini, parsley, green pepper and tortellini. Simmer uncovered for about 35 or 40 minutes or until tortellini are done. Top with parmesan when serving. Note: If you are tempted, as I was, to slightly increase each of the ingredients, you will end up with more of a stew! !